A purchase of business in Illinois will generally be structured either as a merger or acquisition. Acquisitions can be in the form of an asset purchase (a purchase of substantially all of the assets of the selling business), where the buyer may purchase the seller’s assets free and clear of any liabilities, or may assume some liability. The asset purchase agreement will identify the business’ tangible property the buyer will acquire, as well as the the intangible assets, like contracts, leases, trademarks. The asset purchase agreement also identifies any liabilities that the buyer agrees to assume. After the closing of the sale, the business entity itself remains in the hands of the seller-prior owners. A purchase of business in Illinois is generally structured as a merger or acquisition and our Chicago business lawyers, Chicago intellectual property lawyers and team of financial professionals can effectively guide you and your business through the complexities of this type of business transaction. Acquisitions can also be in the form of stock purchase agreements for Illinois corporations or membership unit purchases for LLCs, where the buyer purchases the business’ stock or units and actually takes over the business, instead of just buying the merchandise or assets. In this type of purchase of business, a buyer may purchase all or a portion of the stock (or membership interest) of the business. In an entity purchase, the buyer owns all the same assets and is subject to all the same liabilities that existed prior to the acquisition. 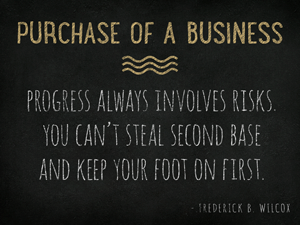 A purchase of business is a complex endeavor. Our Chicago business lawyers, Chicago intellectual property lawyers and team of financial professionals can effectively guide you and your business through the complexities of a purchase of business, merger or acquisition.